What do we risk when spraying chemicals on ourselves and our animals? There are many pros and cons to using harsh chemicals on our animals (and ourselves) to keep biting insects away. The biggest argument made FOR using chemicals is that the bite of an insect could carry with it a disease that would be worse than the side effects of the chemicals being applied. 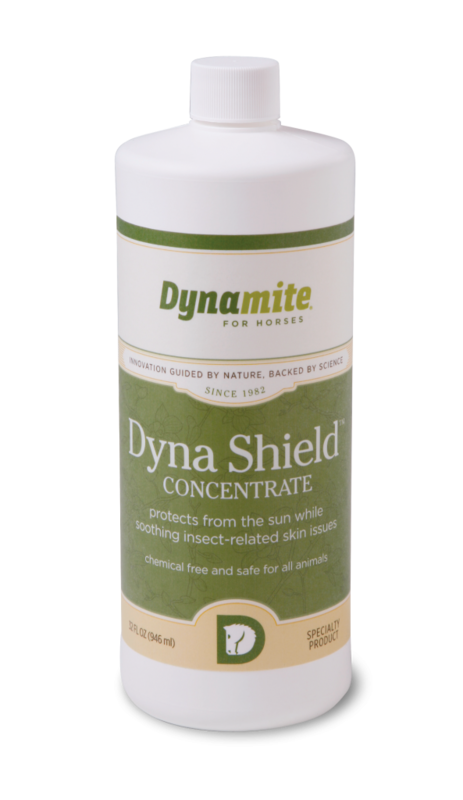 This argument, of course, is a lot more powerful if you do not have an EFFECTIVE, NATURAL alternative to chemical sprays, such as Dyna Shield Natural Horse Spray. Citronella is a grass that mainly grows in some Asian countries and some islands of the South Pacific. It has a rich, crisp lemony aroma and thus bears the name citronella. It’s use as an insect repellent and natural horse spray is one of the most common of citronella essential oil, as it kills and keeps away insects. It has been found particularly effective on a species of mosquito, called Aedes aegypti whose bite causes the dreaded yellow fever. This is also been effectively used for lice, body and head louse, and fleas. Cedarwood essential oil is extracted through the process of steam distillation from the wood pieces of the cedar wood tree, which has the scientific name Juniperus virginiana (also known as Cedrus doedara, Cedrus atlantica, and Cedrus libani, depending on the regions where they are found) in other nomenclature systems. It has been in use as a mosquito and natural horse spray insect repellent for a long time. When used in vaporizers, it drives away mosquitoes, flies, and other insects. It is regularly sprinkled on pillows or sheets at night so mosquitoes and other irritating bugs and pests are driven away while you sleep. Eucalyptus essential oil is obtained from fresh leaves of the tall, evergreen eucalyptus tree (Eucalyptus globulus). It is a well-known natural repellent for mosquitoes. According to a study by the Centers for Disease Control and Prevention (CDC), a mixture of 32% lemon eucalyptus oil provided more than 95% protection against mosquitoes for three hours. As you read the information below regarding the harmful effects of chemical bug sprays, consider the diseases that bugs carry. It’s a difficult decision to “pick your poison” so to speak, between the scary, chemical side-effects and the potential for contracting a disease from an insect bite. There is a better way to increase your protection against disease-carrying bugs, while also limiting your exposure to the harmful chemicals discussed below. 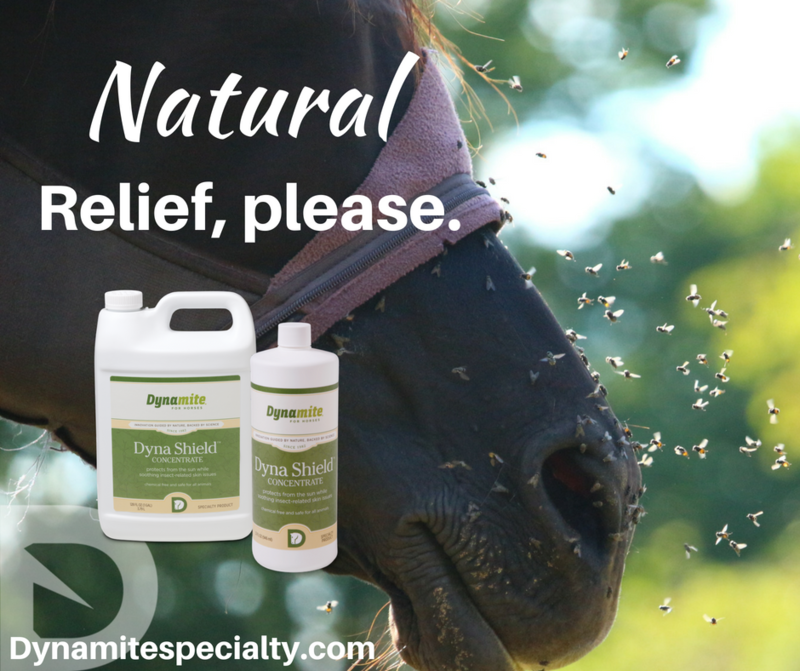 A better choice is to use a natural horse spray containing a blend of natural, proven, botanical oils that can be applied directly to yourself and your animals without adding terrible health risks. Most bug repellents contain DEET (N,N-diethyl-m-toluamide) as their active ingredient. DEET is one of the few insect repellents that work. It is recommended to prevent mosquito-born diseases such as malaria, dengue fever, and West Nile virus. Other less effective forms of bug sprays contain pyrethrins. Pyrethrins are a pesticide created from the chrysanthemum flower. It is generally considered nontoxic, but it can cause breathing problems if you breathe in large amounts. Bug sprays (insect repellents) are sold under various brand names. Persons applying DEET to their skin may get hives or have mild redness and irritation. These symptoms are usually mild and will go away when the product is removed from the skin. Persons who use very high concentrations of DEET on their skin over a long period of time (such as military personnel or game wardens) may have more severe skin reactions that include blistering, burning, and permanent scars of the skin. Other symptoms associated with long-term use of high amounts of DEET (over 50% concentration) include insomnia and mood changes. If DEET is unintentionally sprayed into the eyes, nose, or mouth, you may feel a temporary burning sensation and have redness. Washing the area will usually make the symptoms go away. Burns to the eye may require medication. Low blood pressure (hypotension) and low heart rates (bradycardia) may occur if a large amount is swallowed. By far, the most serious and devastating complication of large DEET poisonings is neurological damage. Patients may have disorientation, clumsiness when walking, seizures, or coma. Death is possible in these cases. DEET is especially dangerous for small children. Seizures may occur in small children who are consistently exposed to DEET on their skin for long periods of time. Care should be taken to only apply lower concentrations of DEET to children for short periods of time. Products containing DEET probably should not be used on infants. Click here to read about Zephyr’s Story of recovery, including the use of Dyna Shield!